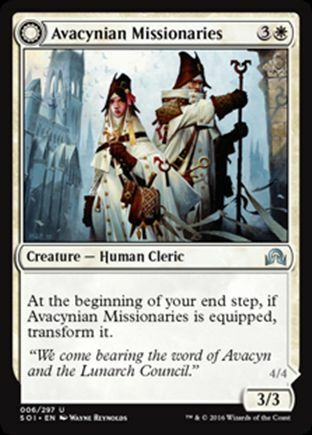 * Dit is het aanbod van Avacynian Missionaries uit Shadows over Innistrad. Als een kaart in meerdere series zit kun je die apart aanklikken hierboven. Klik op de getallen om direct naar iemands collectie te gaan. De leden die het meest recent zijn ingelogd staan bovenaan. Leden die meer dan 14 dagen niet zijn ingelogd worden niet vermeld. The Equipment attached to Avacynian Missionaries remains attached after it transforms into Lunarch Inquisitors. If Lunarch Inquisitors leaves the battlefield before its triggered ability resolves, the target creature won’t be exiled. 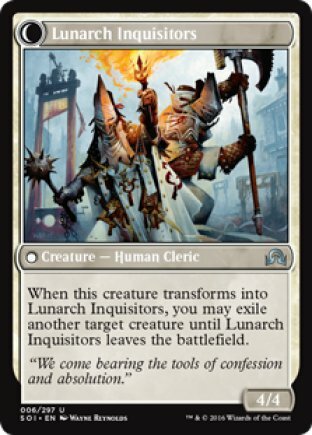 If Lunarch Inquisitors somehow transforms into Avacynian Missionaries, the creature will remain exiled. If Avacynian Missionaries later leaves the battlefield, the creature will return to the battlefield. Auras attached to the exiled creature will be put into their owners’ graveyards. Equipment attached to the exiled creature will become unattached and remain on the battlefield. Any counters on the exiled creature will cease to exist. If a creature token is exiled, it ceases to exist. It won’t be returned to the battlefield. In a multiplayer game, if Lunarch Inquisitors’s owner leaves the game, the exiled card will return to the battlefield. Because the one-shot effect that returns the card isn’t an ability that goes on the stack, it won’t cease to exist along with the leaving player’s spells and abilities on the stack. We hebben alle decks op de site voor je doorzocht en gekeken welke 20 kaarten het meest met Avacynian Missionaries samen worden gespeeld.